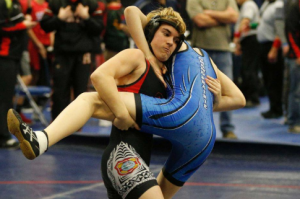 Seventeen year-old Mack Beggs of Euless Trinity High School wanted to compete against boys but, because of Texas school rules, had to compete against girls. Beggs grew in muscle mass after starting a testosterone treatment more than a year before the Texas state championship, according to Texas' Star-Telegram. The University Interscholastic League (UIL), which governs Texas athletics, dictates that students compete according to the gender on their birth certificate. UCLA professor of human genetics and pediatrics Dr. Eric Vilain called the rule "twisted logic." The Star-Telegram reported that "medical and transgender experts said they believe Beggs should not be competing against other girls." Audience members at the state championship reportedly booed Beggs' win, adding to the growing resentment towards Beggs' participation. "I wouldn’t be here today if it weren’t for my teammates. That’s honestly what the spotlight should have been … my teammates," Beggs told the Star-Telegram. Madeleine Rocha of Coppell High School previously forfeited her match against Beggs, allowing Beggs to win a regional title on Feb. 17. Beggs' coach declined to comment on why Rocha forfeited, but said it was expected. Coppell parents sued the UIL, which governs Texas high school sports. The lawsuit claimed that Beggs' testosterone use put female wrestlers under an "imminent threat of bodily harm," according to NBC's Dalls-Fort Worth affiliate.